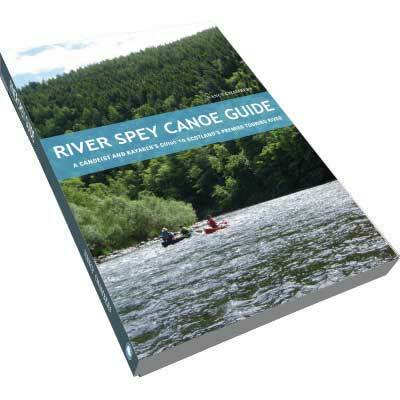 This illustrated guide will help you plan your journey along the River Spey, one of the UK’s classic canoe and kayak touring rivers. The river can be navigated from Loch Spey to Spey Bay, and here is divided into seven sections. These can be paddled as single day trips or combined into multi-day adventures. Each section is described in detail and includes agreed access points, local attractions, and accommodation and camping options. To help you plan your trip there are also eight suggested multi-day itineraries, which range from three to five days. Whether you opt for a five-day expedition or a scenic day trip, here you will find all the information you need to prepare for your journey. There is advice on equipment, food and safety, as well as information on wildlife, wild camping and navigation skills. The River Spey is a stunning river that should be on every paddler’s tick list and this guide will help you to make the most of your journey. Nancy is a passionate paddler who is most at home in her canoe. She is also regularly found in a sea kayak and occasionally in a white water kayak. Multi day journeys are her favourite personal adventure especially if they are spent on the water with her family and friends. She spent her career working in the outdoors and currently works for half her time as an instructor for Glenmore Lodge, the National Outdoor Training Centre, where you will find her delivering a range of paddlesport and mountaineering courses. In addition to this Nancy works for other organisations and occasionally runs bespoke guided or training course for groups. She holds a range of high level outdoor qualifications including the BCU Level 5 Canoe Coach award and enjoys most other outdoor sports. Nancy visited the Aviemore area as a child and has many happy memories of her holidays here. In her late teens she returned to work as a ski instructor, then moved to the west coast of Scotland before returning to live near Aviemore in 2002. She has been paddling on the River Spey since 1990, when she was introduced to its beauty on a staff training trip from Lowport Outdoor Education Centre. Since then she has paddled regularly in the area and all around Scotland. Excellent information and photography. Put it to the test last week with a trip down the Spey, it was indispensable.